Sterling Systems & Controls, Inc. can offer a bakery batching system and other automated solutions for bakeries and food manufacturing. Receiving of raw materials, batching, weighing, mixing, powder batching systems and the control of other process equipment can be automated. An individual bakery batching system, or automation of a combined group of process equipment and systems can be accomplished. Raw material handling systems, e.g. pneumatic and mechanical conveying, liquid weighing and metering systems, bulk bag unloading, micro, minor and major ingredient weighing and batching systems can provided. Seamless interaction of all the production processes in the bakery is crucial – and integrated automation with data management and lot tracking provides a perfect answer. We can easily assess your specific needs. Then, we will provide you with the bakery batching system, and other production solutions that you need. Also, we can allow users on your corporate network to access data from a Sterling Systems control system. This provides for the ability to manage ingredients, formulas, bin assignments, schedules, and other data tables of the bakery batching system. Also, it allows users to view and print historical batching and process data reports. 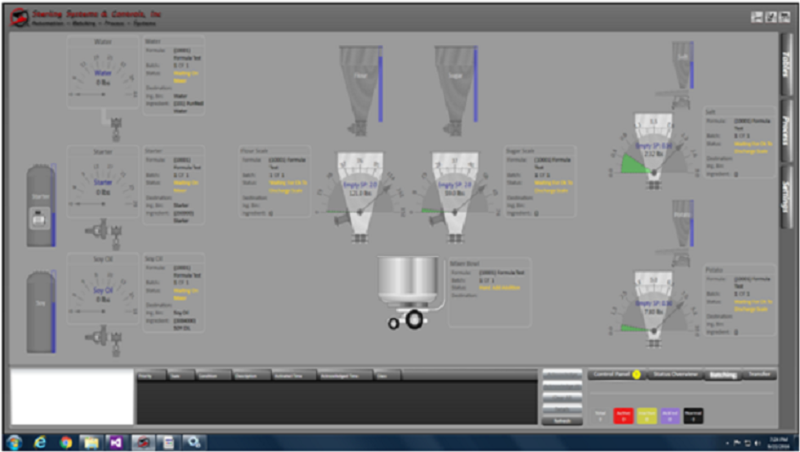 Users can monitor key process and batching data and alarm conditions within the control system. They can provide logging and historical analysis of this data as well. Our PC and PLC control systems are great at controlling process equipment, whereas your business system hardware and databases are good at managing data, and Sterling Systems & Controls, Inc. can provide the means to bridge these two worlds. This provides a seamlessly integrated solution. You will benefit from efficient bakery production processes that deliver maximum quality at reduced cost. Automating the mixing or blending process is one example. One such solution is summarized here.